There's a new Asian restaurant in town, and they have a couple of those teppanyaki tables, where the chef "performs" your meal at a large griddle at the center of the table. 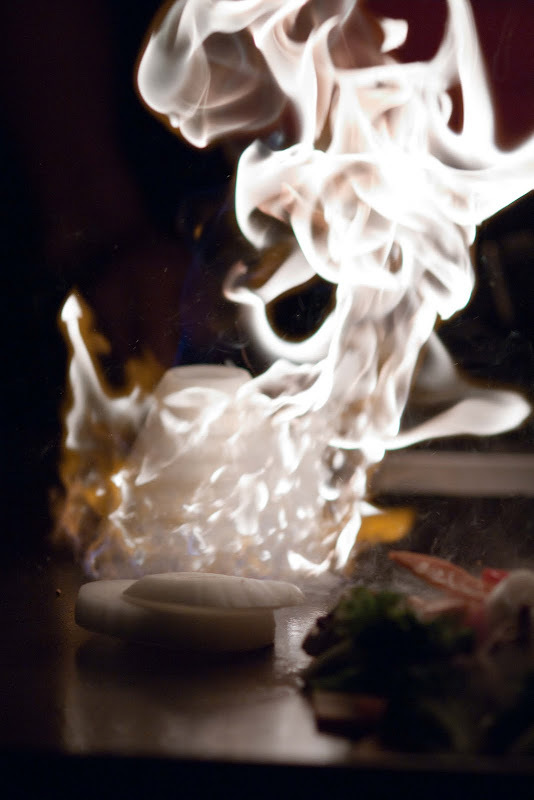 It's very dramatic, with clanging knives, shrimp tails flying, and flames. Lots of flames. The volcano - a standard stunt - is accomplished by stacking onion slices to form a cone. Add a squirt of fuel (alcohol of some kind), a lit match, and.... whoosh! If you go, sit back -- way back, to protect your eyebrows -- and enjoy the show. was this your reward for being the hostest with the mostest this past weekend? Wonderful capture of the flames.